How is the digital age impacting on the business world? How are companies facing this new environment? OpenMind analyzes the effects of digital transformation through the eyes of 19 international authors in the book “Reinventing the Company in the Digital Age”. 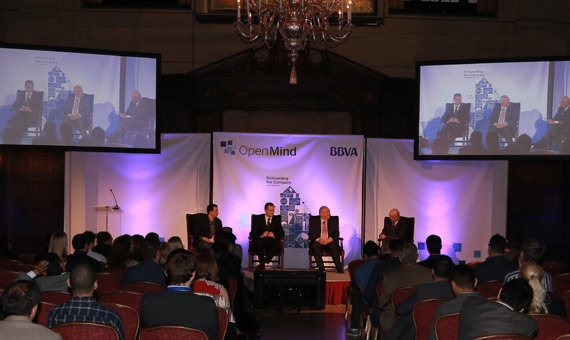 On April 21, Francisco González, Chairman and CEO of BBVA, presented the latest book in the OpenMind series at the Harvard Club of Boston, along with two of its authors, Esteban Garcia-Canal (University of Oviedo) and Peter Thomson (Henley Business School), specialists in international business and management teams respectively. During the ceremony three different perspectives on the digital transformation were introduced, all with the same goal: understanding the change experienced by the world of business. Esteban Garcia-Canal focused his presentation on the rise of emerging economies (in 20 years they have risen from 15% of global economic activity up to 50%) and analyzed successful multinationals that have emerged in these countries. How do these new multinationals operate and what is the key to their success? For Garcia-Canal, these companies have sprung up in countries with weak institutional environments and have used the experience gained in their home countries to compete in complex environments. Moreover, paradoxically, their slight previous international presence has allowed them to adopt a strategy and organizational structure that have proved the well adapted for the current context, in which emerging economies are growing rapidly. Read about all the keys in the article by García-Canal and Guillén (Wharton), “The Rise of New Multinationals”. People are. Paradoxically, behind these changes and new business scenarios there are things that never change: values, ethics and good leadership. They are the words of Francisco González, who closed the day with a presentation of his article “Transforming an Analog into a Digital Company: The Case of BBVA”. González used the case of BBVA as an example of the current transformation. A cutting edge technological platform, Big Data projects and new design all come together to create more modern, agile and collaborative organizational structures; these are some of the tools that comprise the group’s initiatives to meet the challenges posed by the new business scenario. The main drivers of this transformation are without doubt, the people, leaders and employees who make up the company.